1. To search for theses and dissertations from the University of Washington, go to the Advanced Search option on the UW Libraries homepage. 2. In Advanced Search, select "in subject" from the drop-down menu, and "is (exact)" from the second drop-down menu. Type "theses [subject/department]" into the search field. For example, if you are interested in finding theses from the History department, you would type "theses history" into the search box and then click Search. Theses can be available online, as print copies, or in both formats. Note: For the most complete listing of UW theses that are archived online, visit the ResearchWorks Archive. There may be a digital copy of a thesis even if it does not appear in UW Libraries Search, particularly in the case of older theses. You can confirm that the item you are looking for is a thesis in several ways. If it is a print thesis, the location information may confirm you are looking at a thesis. You can also click on the Item Details to look at the subject and publisher information for further confirmation. Filter your search to online items only by clicking on "Available Online." Click "Online access" for more information. In the "View It" section, click "online" to access the online thesis/dissertation. 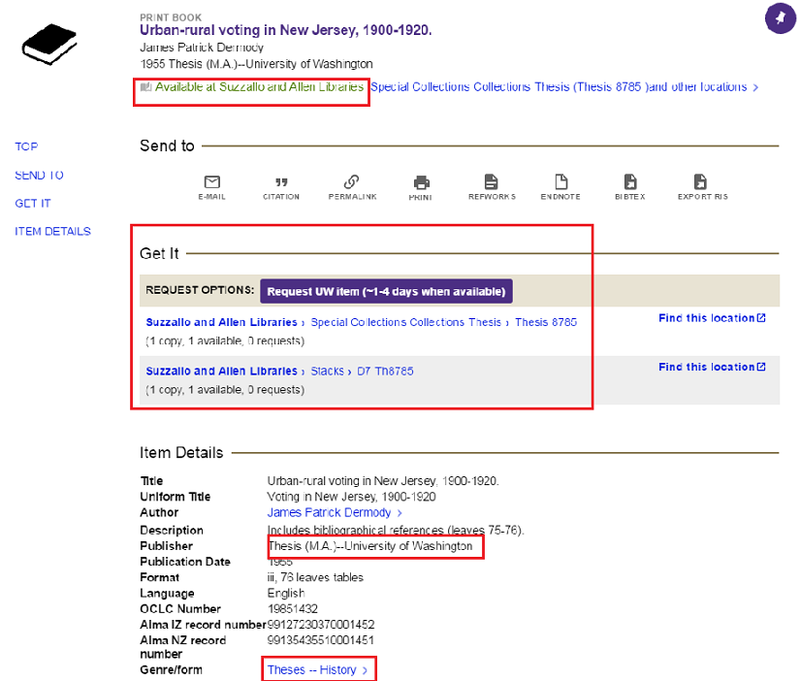 Filter your search by clicking on "Available in the Library." To see more information, click on "Available at". This includes information on whether the item is available for checkout and where it can be found in the library. Find more information on how to find dissertations and theses at the University of Washington and beyond with our Dissertations & Theses Research Guide.